Last January we travelled to the Caribbean with my husband's family. After much discussion and debate, we ended up in Barbados. The beaches were lovely, golf courses plentiful, but most important to the consideration of location, incident rates of Malaria and the lesser known Chikungunya were tempered relative to other vacation hot spots. While both conditions are serious and require prompt and appropriate medical care, neither were stirring me away or towards particular beach destinations. In short, I was just not that worked up about it. I saw it as a controlled risk, one I was willing to take for the sake of my mental health and the opportunity to spend time on the beach (likely is a sprayed area) with my children. While easily perceived as simply naïve, my tempered concern related to Malaria and Chikungunya were contextualized to a more pressing fear, much closer to home; Lyme disease. It is debilitating, it is poorly diagnosed and it is endemic in Ontario. Forget the drama of tropical mosquito nets and the debate over DEET, understanding Lyme disease and your risk SHOULD be included in your vacation conversations this summer. Lyme disease is becoming more rampant in it's typical breeding ground in the North Western U.S. as well as Canada. CDC reports indicate that the incidence of Lyme disease have increased by over 320 per cent since 1993. Lyme disease is carried in ticks that were traditionally preyed upon by white mice. With increased clear cutting and a warming climate in areas further north, the ticks travelled rapidly on the backs of dear and found themselves inhabiting the grassy fields prevalent in the northern U.S. and Canada. Lyme disease is transferred to humans when we are bit by a tick carrying Lyme. Lyme infected ticks are in fact transferring a bacteria called Borrelia burgdorferi, a potent little bug with a propensity to hide and mimic other common conditions. The symptoms associated with Lyme depend on who you ask. Many common resources will mention, fever, body-aches, malaise, headaches, fatigue and the famous bulls-eye rash. If you are lucky, these are the symptoms you will develop. Luck is paramount, because a classic presentation usually leads to prompt treatment. While more and more physicians will acknowledge Lyme, there remains a subgroup that still "believe" that Lyme is not a condition found in Canada. Oh dear! The more common situation is that people are bit by a tick and don't notice. Or, they are bit by a tick and don't develop any classic symptoms. Some resources suggest that up to 40 per cent of infections do NOT develop the bull's-eye rash. For many of my patients, Lyme did not become part of their medical team's discussion until they had received a battery of tests, seen a plethora of physicians and had exhausted all other possibilities. These people, many of whom are my patients, were given anti-depressants and referred to psychiatrists for "psychosomatic stress disorders." Many eventually resorted to US physicians for assistance. For these patients, the joint pain, muscle aches, headaches, lack of energy, cardiovascular symptoms, neurological manifestations and chronic illness had become debilitating. Most of these individuals were eventually helped through the assistance of progressive and comprehensive testing from U.S. labs and treatment in U.S. facilities. These expenses were paid for out of pocket. So why is Lyme not be tested and treated effectively in Canada? Great question. Ontario's (actually Canada's) testing for Lyme looks for a very limited profile of Borrelia burgdorferi and is riddled with false-negatives. While "Lyme-Literate" physicians are aware of this shortcoming, many GPs are not. Early detection is critical and the system, as it stands now, is not equipped to detect or treat new cases of Lyme with any significant reliability. Ticks LOVE long grass and wooded areas -- the kind you would lose your ball in on an average day of golfing. The young deer ticks that cause Lyme are most active from mid-May to mid-August and are roughly the size of a poppy seed. 1. If you do need to be in the woods or grass, ensure you are wearing long pants. 2. Check your body and those of your kids and pets EVERY time you come in from having been outside. 3. Check you legs after sitting on the ground in areas with long grass or against stone walls. 4. Tie you hair back when gardening. 5. 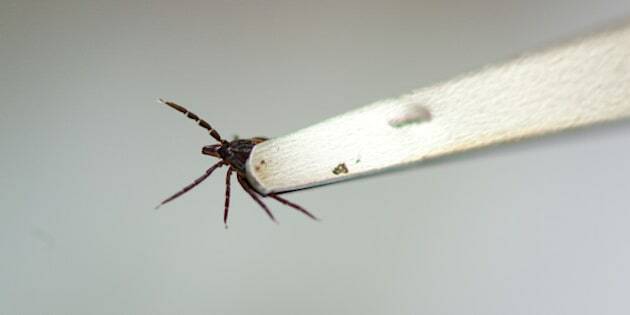 If you suspect you have a tick, seek the assistance of a walk-in clinic or your doctor as soon as possible. 6. If you have been experiencing chronic, undiagnosed symptoms such as numbness and tingling, joint pain, headaches or other unexplained symptoms, it may be worth consulting a Lyme literate physician. I am not a worrier. My last irrational encounter with worry was after seeing jaws -- I convinced myself for years that there were great white sharks lurking in Lake Muskoka. While this fear was eventually tempered, the evidence related to Lyme disease is continuing to grow. It is worrisome, it is political and it is not going away. Canada has a "Lyme Strategy" that most experts feel is vastly inadequate to deal with the scope and severity of the disease. This is not meant to temper your vacation or desire to frolic in the long summer grass. It is meant to provide an ounce of prevention and awareness for a condition that deserves our respect. Play with awareness and have fun with the full body scans.